I know, I know, I wrote about health care less than a week ago but everyone just has to read this post from Ezra Klein. Yep. Medicare and Medicaid. 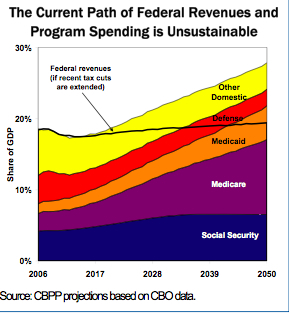 Now, because the government releases a lot of graphs like this one, a lot of folks end up believing that the problem is Medicare and Medicaid. But it’s not. 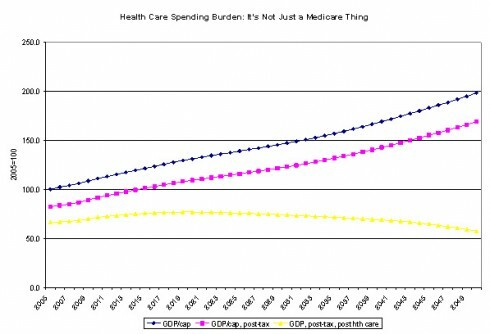 It’s generalized health care spending, and it’s as much a burden on the private sector as the public treasury. 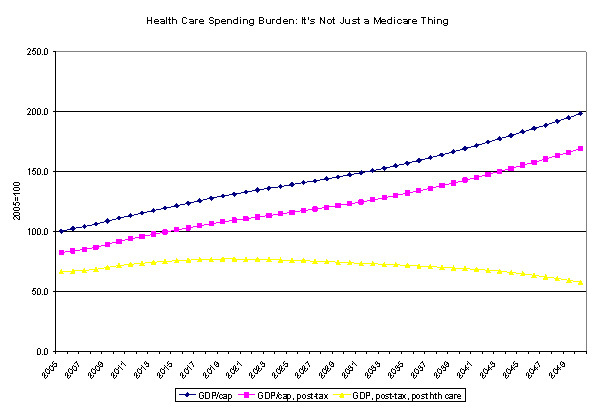 The next graph tracks the next few decades in GDP per capita, then in GDP per capita after taxes (which is to say, including cost increases in Medicare and Medicaid), then, on the yellow line, GDP per capita after taxes and after private health care spending. And what you see is, to a wonk’s mind, quite scary: Real income actually goes down. The country becomes, effectively, poorer. The amount of money this country spends on health care is staggering, and without major changes, things are only going to get worse. So, while we worry about the money we may or may not be spending on bailing out Wall Street, we shouldn’t forget where a good deal more of our money is being wastefully spent. Read Barack Obama’s health care plan and John McCain’s and decide for yourself which one sounds like it will more plausibly extend coverage and eventually lower costs. This entry was posted on at 10:19 am, filed under Economics, Health, U.S., U.S. Politics and tagged Bailout, Entitlement spending, Ezra Klein, GDP, government spending, health care, medicaid, Medicare, Recession, universal health care, wages, Wall Street, welfare. Bookmark the permalink. Follow any comments here with the RSS feed for this post. Both comments and trackbacks are currently closed.